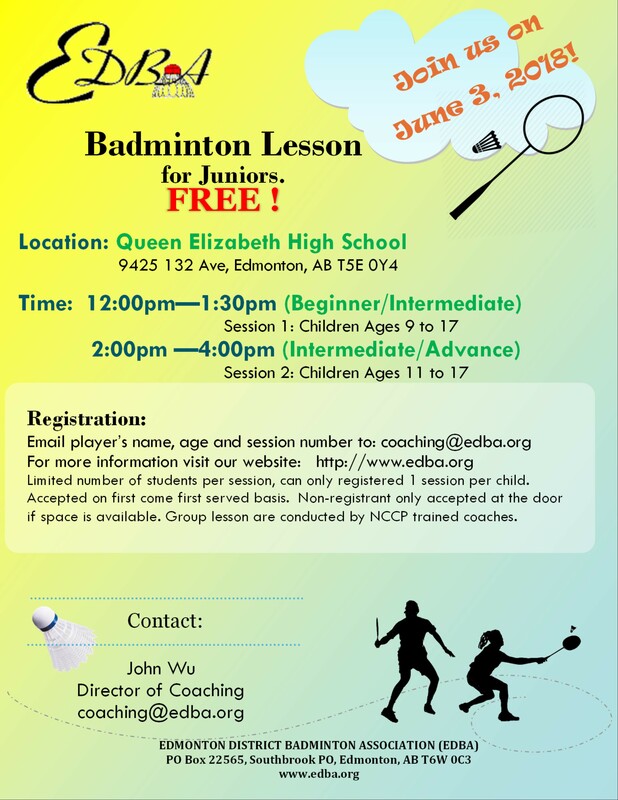 EDBA is conducting a FREE Badminton lesson workshop for players ages 9 to 17 on Sunday June, 03, 2018 at Queen Elizabeth High School. The workshop is open to anyone interested in trying out Badminton or/and want to try out a group lesson class. Players and parents have the opportunity to find out more information about EDBA and the junior programs. Also, players will take part in a group lesson conducted by National Coaching Certification Program (NCCP) trained coaches. Limited number of students per session, can only registered 1 session per child. Accepted on first come first served basis. Non-registrant only accepted at the door if space is available. *intermediate level – player must be able to sustain a continuous rally for few minutes and understand the game rules. Players must bring their own racquet and indoor non-marking court shoes. Lesson are trained in a group environment by NCCP trained coaches. UPDATE: SEE WINNERS LIST BELOW! 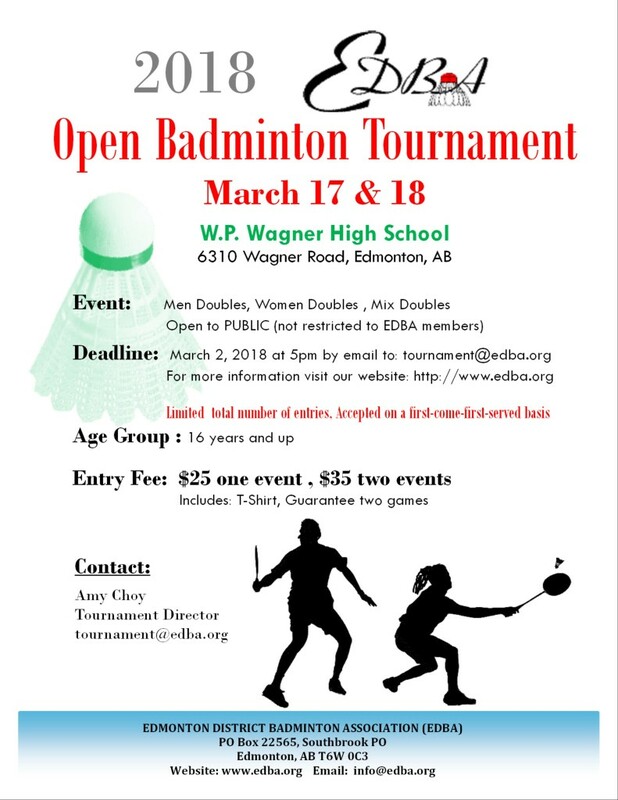 Our 2018 EDBA Open Badminton Tournament is scheduled on March 17 & 18, 2018 at W.P. Wagner School (6310 Wagner Road) in Edmonton. A, B, or C levels for Men’s Doubles, Ladies’ Doubles and Mixed Doubles. Sorry, no singles events. $25 for one event, $35 for two events. Entry fee includes one EDBA T-shirt and we guarantee two games. Tentatively, Men’s Doubles on Saturday Morning and early afternoon. Ladies’ Doubles immediately after on Saturday. Mixed Doubles start on Sunday Morning. Entry is not completed until payment is made in full. Your Doubles Events are treated separately from your Mixed Event. For example, if you are a male, normally an “A” level player but your Mixed Double partner, Amy, is a “C” player, please enter as “A” for Mixed Doubles. (play up only). For Amy, if she partners with a “B” female partner in Ladies Doubles, please enter as “B” for Ladies Doubles. (play up only). Same rules apply for your Men Doubles. EDBA view Amy as “forced” to play up as “A” in the Mixed Doubles and “B” in the Ladies Doubles only because her partners happen to be in “A” and “B”, not because Amy is a bona fide “A” player. Please note that I rely on Badminton Canada, Concordia Open, N.A.I.T. Open, U of A Badminton Open, Kings Open, and Metro City High School results for reference. Entry is not completed until payment received in full. NSF fee will be charged on bounced cheques.